April 2011 transit service changes – they’re massive! This bus might not be coming out of storage, but the "14 Hastings" is. When a print Buzzer devotes most of its print issue on the upcoming service changes, you know it’s important. Thanks to TransLink’s Service Optimization program, under-performing segments of the bus schedules have been re-allocated to other segments that really need it. The system is essentially working within its own service-hours constraints and attempting to get the most bang for its buck. I won’t repeat all of the changes; they’re in either of the top links. I’ll just offer an opinion on the ones I found interesting. Creation of 14 Hastings/UBC from the relevant sections of the 10 and 17: this brings back the classic routing (although it makes the full run between UBC and Kootenay Loop only during the daytime). What makes it interesting is that TransLink did not change the NightBus number for the service between UBC and downtown; it remains as N17. Hopefully that will be rectified very soon. 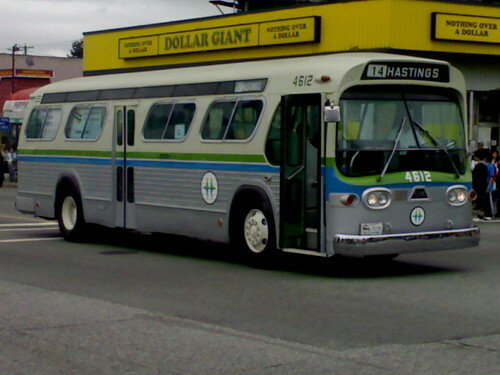 Here is a Buzzer Blog interview with a TransLink planner that includes many historical photos of the 14 Hastings in its various incarnations. Interline of the 15 and 50: with the 17 Oak returning to the Cambie Bridge, the 15 is truncated to Olympic Village Station and merged with the 50 False Creek South. This is a very interesting move. As someone has commented on the Buzzer Blog, it paves the way for this combined route to be given a single number, to which I commented that it should be given the 15, because of its long association with the Cambie Street service. Here is one lament for the soon-to-be truncated 15 Cambie. 209 Upper Lynn Valley/Vancouver: not actually new, but renumbered from the 4. The impact might not be so bad, but I can see all sorts of confusion, such as from those wanting to catch the 4, but won’t board the 209 because they think it’s on suburban stopping procedures (like the 210). C19 becomes a weekend-only service. I don’t understand this, especially moving into summer, when weekday demand to the beaches on NW Marine could be justified. How about daily, half-hourly service from May to October, then daily, hourly service the rest of the year? 480 truncated at Bridgeport Station: A good start, but the buses could be better allocated to east-west services north of the Fraser to bolster those services to UBC. This one isn’t listed, but it’s more of a follow-up to my past field reports on the poor reliability record of route 25. It looks like TransLink has paid attention, as the travel times for weekend midday service have been increased, in some cases by as much as five minutes. Oddly, the travel times appear only minimally increased for weekdays. See for yourself: here is the December 2010 timetable for the 25, and here is the one for April (both PDFs). Unfortunately, there are casualties, with some routes, particularly in Burnaby and Coquitlam, having their late-evening frequencies dropped from 30 to 60 minutes. Even Vancouver isn’t spared, as routes 26, 27, and 29 suffer the same fate. I would like to know if this will adversely affect anyone, and what, if anything, TransLink can do about it. Good summary. Be sure to say these things to TransLink.